Sign the pledge to stand with Pacific Islanders as they face up to climate change, and to receive email updates about the Pacific Climate Warriors. These traditional style canoes, will be taken with the Pacific Climate Warriors on a historic journey arriving into Australia in October. Why the voyage to Australia? The situation is clear: it’s either the fossil fuel industry that has to back down, or the Pacific Islands. We’re calling up the warriors of the Pacific to show that the Pacific Islands will not back down. The fossil fuel industry must keep 80% of its proven reserves in the ground to stop the globe warming more than 2 degrees. The islands are already witnessing the effects of climate change. A majority of the Pacific Islands depend on subsistence agriculture, but with more intense tropical cyclones, flash floods and droughts, our food production systems are increasingly vulnerable. Scientists have warned that if the world doesn’t change track now, we face complete upheaval and displacement for many of our islands. The Pacific Climate Warrior journey will allow us to cross the geographic divide separating us from the source of emissions and highlight the direct impacts of Australian fossil fuels on their Pacific neighbours. We will spend our time in Australia connecting with local Pacific communities and the wider public, sharing our stories and raising our voices to fight peacefully for our islands. Who is this voyage being organised by? Five years ago, a network of young Pacific Islanders began to form across the Pacific Ocean, under the name of 350 Pacific, and as part of the global climate change movement, 350.org. Active in 15 of the Pacific Islands, we have a unique approach of empowering young people to understand the issue of climate change and take action to protect and enrich our islands, cultures, and oceans. We’re asking the international community to stand in support with the Pacific Warriors. We know that this project is beyond what we can deliver on our own. We don’t have big bank accounts, big funders, or our own sailing boats. 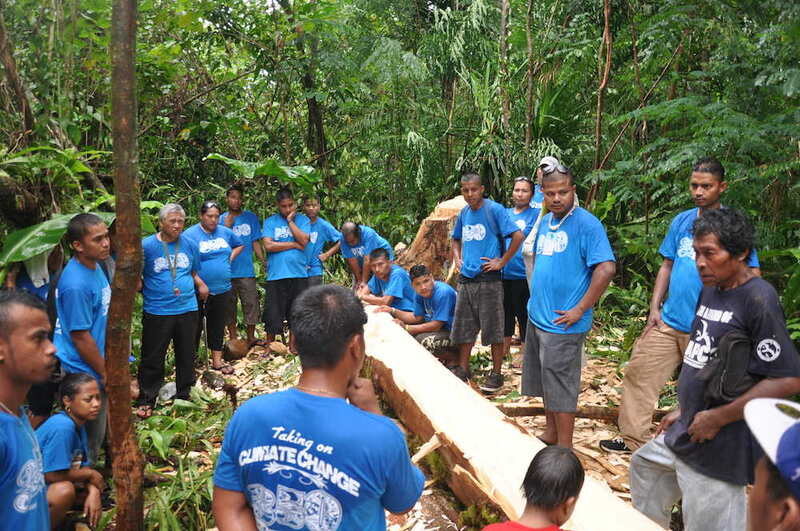 What we do have is the network of courageous young Pacific Islanders – from Niue to Tuvalu – that are busy learning the skills of canoe building from their elders, are clued up about how climate change is affecting their Islands, and are ready to stand up peacefully but powerfully as warriors for their Islands. We are building canoes, and are now asking the international community for your support. Click here to pledge now.